Two years after Rick Astley (one of my 80’s favs!) released Together Forever, John and I married. And it was then I promised, “until death do we part.” Of course, those were easy words to say as I stood there in my white dress with ruffled train and the flash of cameras brightened John’s smile even more (zing*) . . . but living out the ideal has challenged me more than I ever imagined. While I wanted to believe (like Rick Astley sang) it was “something to last for all time.” As the years go by I’ve had to move beyond all my romantic notions concerning marriage, and I’ve had to work hard to make it last. Like anything I’ve really wanted to succeed at, such as getting good grades in college, becoming a published author, or raising godly kids, I’ve had to put in the time to train myself to be successful. Hard work doesn’t sound romantic, but neither does going through a divorce, or trying to split our assets, or sharing the kids 50/50. Jim Burns, author of Creating an Intimate Marriage, compares the work that goes into a healthy marriage as similar to training for a marathon. “If we want to have a healthy relationship, we have to put in the training and do what it takes to make it work. Despite the way Hollywood depicts intimacy, good things don’t just “happen”; proper training is vital to accomplishing any goal. Contentment is a result of our proper training! Just like running a marathon, an intimate marriage takes an investment of time, energy, focus, and sometimes the help and coaching of others. It may mean something as simple as setting up daily routines that you know in the long run will produce more intimacy in the relationship. Sure there are sacrifices to make, but the result of intimacy and contentment make the effort worthwhile.” –Jim Burns (Minneapolis, Minnesota: Bethany House Publishers, 2006), p. 51. 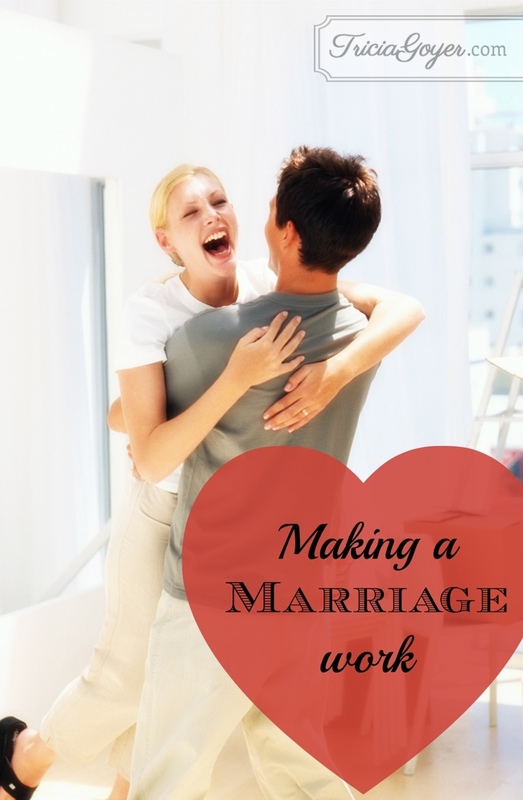 What are some ways that you maintain and prioritize a healthy relationship with your spouse? Get on the same page with your spouse. Find time to sit down together and talk about your expectations and frustrations. Carve out time each week to spend together, whether that means going for a walk together or having a special dinner together. Share your struggles and pray about them together. Make sure to check in with your spouse throughout the week about how he is doing. Considering reading through a book together about marriage and challenge each other to put what you’ve learned into action. Thank you for the blessing of marriage, and thank you for providing the perfect example of what it means to be in relationship. Lord, it’s tough work being married and sometimes I have doubts. Please give me the strength, wisdom, and humility to be the spouse I should.